Remissa provides food available for take away and also has a wide variety of pastries. How to get there: A 4 minute walk through Bert Street, exactly located near the boutique hotel. It is a bar along with the Universal Sports Restaurant and opens in weekends. It is located nearby the Gozo Stadium. West End Bar also hosts a number of local Djs who play the most popular current songs across all genres. It is an ideal spot to take a drink and enjoy the free time with the locals. X.T. 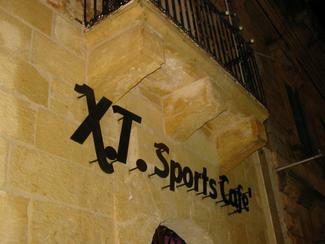 Sports Cafe’ is located in the main square of Xewkija. This bar is ideal for sipping a coffee and trying local pastizzi (a traditional local pastry with a filling either of ricotta or peas) or home made traditional Hobz biz-Zejt (Local crusty ftira bread with tomato paste, capers, chopped onions, garlic, tuna, sea salt and pepper). It is also an ideal place to watch a classic football match.